For other uses, see Hollywood Boulevard (disambiguation). Hollywood Boulevard was originally named Prospect Avenue until 1910, when the town of Hollywood, created by H.J. Whitley, was annexed by the neighboring City of Los Angeles. After annexation, the street numbers changed from 100 Prospect Avenue, at Vermont Avenue, to 6400 Hollywood Boulevard. In the early 1920s, real estate developer Charles E. Toberman (the "Father of Hollywood") envisioned a thriving Hollywood theatre district. Toberman was involved in 36 projects while building the Max Factor Building, Hollywood Roosevelt Hotel and the Hollywood Masonic Temple. With Sid Grauman, he opened the three themed theatres: Egyptian, El Capitan ("The Captain") (1926), and Chinese. In 1946, Gene Autry, while riding his horse in the Hollywood Christmas Parade — which passes down Hollywood Boulevard each year on the Sunday after Thanksgiving — heard young parade watchers yelling, "Here comes Santa Claus, here comes Santa Claus!" and was inspired to write "Here Comes Santa Claus" with Oakley Haldeman. In 1958, the Hollywood Walk of Fame, which runs from La Brea Avenue east to Gower Street (and an additional three blocks on Vine Street), was created as a tribute to artists working in the entertainment industry. In 1985, a portion of Hollywood Boulevard in Hollywood was listed in the National Register of Historic Places as part of the "Hollywood Boulevard Commercial and Entertainment District". In 1992, the street was paved with glittery asphalt between Vine Street and La Brea Boulevard. The El Capitan Theatre was refurbished in 1991 then damaged in the 1994 Northridge earthquake. The full El Capitan building was fully restored and upgraded in December 1997. 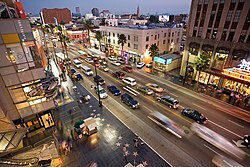 The Hollywood Entertainment District, a self-taxing business improvement district, was formed for the properties from La Brea to McCadden on the boulevard. The Hollywood extension of the Metro Red Line subway was opened in June 1999, running from Downtown Los Angeles to the San Fernando Valley. Stops on Hollywood Boulevard are located at Western Avenue, Vine Street, and Highland Avenue. Metro Local lines 180, 181, and 217, and Metro Rapid line 780 also serve Hollywood Boulevard. An anti-cruising ordinance prohibits driving on parts of the boulevard more than twice in four hours. Beginning in 1995, then Los Angeles City Council member Jackie Goldberg initiated efforts to clean up Hollywood Boulevard and reverse its decades-long slide into disrepute. Central to these efforts was the construction of the Hollywood and Highland Center and adjacent Dolby Theatre (originally known as the Kodak Theater) in 2001. In early 2006, the city made revamping plans on Hollywood Boulevard for future tourists. The three-part plan was to exchange the original streetlights with red stars into two-headed old-fashioned streetlights, put in new palm trees, and put in new stoplights. The renovations were completed in late 2006. In the few years leading up to 2007, more than $2 billion was spent on projects in the neighborhood, including mixed-use retail and apartment complexes and new schools and museums. Advocates promote the idea of closing Hollywood Boulevard to traffic and create a Pedestrian zone from La Brea Avenue to Highland Avenue citing an increase in tourism, movie premier and award shows show closures, including 10 days for the Academy Award ceremony at the Dolby Theater. Similar to Third Street Promenade, Fremont Street or similar to some street closures in Times Squares Pedestrian Plaza's created in 2015. A popular event that takes place on the Boulevard is the complete transformation of the street to a Christmas theme. Shops and department stores attract customers by lighting their stores and the entire street with decorated Christmas trees and Christmas lights. The street essentially becomes "Santa Claus Lane." ^ Lord, Rosemary (2002). Los Angeles: Then and Now. San Diego, CA: Thunder Bay Press. pp. 90–91. ISBN 1-57145-794-1. ^ a b Vaughn, Susan (March 3, 1998). "El Capitan Courageous". Los Angeles Times. Retrieved September 7, 2015. ^ "Home - The Hollywood Christmas Parade." The Hollywood Christmas Parade. N.p., n.d. Web. 23 May 2014. ^ Krikorian, Greg (September 5, 1992). "Hollywood Blvd. to Be Paved With Glitz". Los Angeles Times. Retrieved December 12, 2018. ^ Martin H and McCormack S (September 24, 1999): Idled by the Law : As Cities Crack Down on Cruising, Car Culture Aficionados Find Other Outlets. Los Angeles Times archive. Retrieved March 26, 2013. ^ a b Steinhauer, Jennifer (January 26, 2007). "Development at Hollywood Boulevard and Vine Street spurs Tinseltown renaissance". International Herald Tribune. Retrieved August 14, 2012. ^ Walker, Alissa (2 March 2018). "Make the Oscars street closures permanent". Curbed LA. ^ Masters, Nathan. "When Hollywood Boulevard Became Santa Claus Lane | LA as Subject | SoCal Focus | KCET." KCET. N.p., n.d. Web. 23 May 2014. 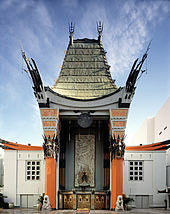 Wikimedia Commons has media related to Hollywood Boulevard, Hollywood.